In 1997, Texas adopted a new law after the US Court of Appeals banned race-based affirmative action in Hopwood v. Texas, a case brought by four white applicants who were denied admission to the University of Texas School of Law. The law guarantees admission to the public colleges and universities of Texas to graduating seniors in the top 10 percent of every high school in the state. The program, which was developed by a group of Latino and black activists, legislators, and academics, passed in the Texas legislature by one vote, after a conservative Republican rural member whose constituents were not regularly being admitted to the University of Texas decided to support the legislation. As predicted, the plan increased minority enrollments and that of rural white students at the flagship public universities in the state. Those students who gain entrance under the plan do so by class rank, not standardized tests or extracurricular activities that they may not have time or money to afford. The program has repaired one shred in Texas’ social contract, forcing the same kind of trade-off s that robustly diverse private institutions like Rice University make in order to enrich their racial, geographic, and socioeconomic demographics. The Ten Percent Plan ameliorates the effects of separate and unequal K-12 education by admitting high achievers from all places from which they apply. The law ended the dominance of a small number of wealthy high schools in UT admissions. And it changed the college-going behavior of high achievers in remote places that had never bothered to apply to UT Austin. Before the law was passed, 59 high schools accounted for half of UT’s freshman class, among the 1,500 high schools in the state. By 2006, that number had nearly doubled. The impact was pronounced at UT Austin. Between 1996 and 2007, the number of feeder high schools to the flagship campus rose from 674 to more than 900. Researchers found that these new high schools were more likely to have large concentrations of minority students and poor white students and to be in rural areas or small towns and cities. They also found that once a high school experienced success in sending a student to the flagship, they continued to do so. The researchers surmised that one reason for the success in increasing applications from new places was that the Ten Percent Plan made transparent a previously opaque and unknown UT admission policy of accepting most students in the top 10 percent of their class. In other words, the Ten Percent Plan had the same effect as the tailored brochure that researchers Hoxby and Turner sent to high achievers in overlooked places. And the same effect QuestBridge has in eliminating confusion about the financial aid process by simply offering a full scholarship to low-income high achievers. All of these interventions helped high achievers from low-opportunity places understand that they could compete and access better opportunities. The Ten Percent Plan has produced other important benefits. In addition to spawning similar laws in California and Florida, studies have shown that “Ten Percenters” outperform all other admitted students on all measures. Typically they have lower attrition rates, graduate in shorter time periods, and have better grades. The end result is that affluent people concentrated in resource-rich school districts can no longer hoard an important public resource--the University of Texas--that is subsidized by all Texas taxpayers. And the plan has improved the quality and breadth of the pipeline to higher education in the state. One researcher found that the plan stimulated college-going behavior at schools that had weak college traditions. Student enrollment in advanced courses and attendance rates surged at high schools across the state after the plan was enacted. A state-sponsored scholarship program that encouraged students at disadvantaged high schools to attend UT and Texas A&M deepened these trends. These interventions on behalf of students in disadvantaged districts likely would not have been created had the Hopwood ban not propelled the state to innovate. Critics of the Ten Percent Plan point to the fact that it has caused some strategic behavior. One study found that as many as 25 percent of students intentionally choose a different high school in order to improve chances of being in the top 10 percent. Such strategic students tend to opt for a neighborhood high school instead of a more competitive magnet school. I view this as salutary. It means that neighborhood schools are becoming more viable to more children, that college knowledge is being spread around because the most motivated students are not isolated in enclaves of advantage. Despite this public policy success, parents in wealthy school attendance zones have repeatedly attacked the plan as unfair to highly qualified children in challenging schools that fall into the 11 percent or lower rank. After all, their kids are in a pressure cooker. In many cases, they have higher standardized test scores and have taken more AP classes than Ten Percenters from less advantaged schools. Parents raised their voices, and their representatives in the state legislature tried repeatedly to amend or repeal the plan, but the coalition backing the law has succeeded in thwarting those attempts for a decade. In the Texas House of Representatives, white Republicans from rural districts, blacks, and Latinos strongly support the existing program. They agreed to one amendment in 2009 whereby only UT Austin received some flexibility. That flagship campus can now limit Ten Percenters to 75 percent of its entering class, although it had sought a cap of 50 percent. Republican Dan Branch of Dallas and Democrat Mike Villarreal of San Antonio brokered this compromise. The end result of a temporary ban on affirmative action in the late 1990s is a successful public policy that enhances opportunity across the state and a more cohesive politics-- at least on the issue of access to public higher education in Texas. Members of a state legislature that rivals Washington, DC, for political gridlock have forged an enduring coalition for access that upsets the usual disproportionate influence of affluent suburbs on the state legislature. 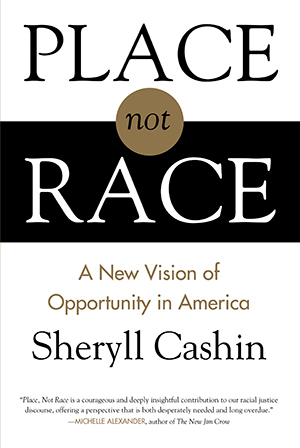 Excerpted from Place, Not Race: A New Vision of Opportunity in America by Sheryll Cashin. Copyright 2014. Excerpted with permission by Beacon Press.